Anyone can become a victim of suicide, traumatic road accident, homicide or violent crime. When such misfortunes take place, crime scene cleanup technicians come in handy. Crime scene cleaners play a vital role in our society. They provide essential crime scene cleaning, and blood cleanup services to those affected directly or indirectly. Well, despite their importance, many people don’t really understand what crime scene cleanup is all about. Most consumers have been brainwashed by crime scene movies they watch. As a result of this brainwashing, people come up with numerous myths about crime scene cleanup service providers. Some of these myths are pure misconceptions that end up creating great confusion amongst consumers. It is common for people to think that crime scene cleanup services rendered by respective companies are paid for by the investigating law enforcement organs. Law enforcement/investigators only visit crime scenes for investigation purposes only. Crime scene cleanup is always left to those affected. While unexpected expenses can be overwhelming for many people, it is the victims or property owners who pay for crime scene cleanup services either in cash or through their insurance covers. The blunt truth is that law enforcement bodies only pay for crime scene cleanup services in movies. Many people think that professional blood cleanup technicians are also investigators like it happens in thrilling television shows like CSI, and Dexter among others. In reality, crime scene cleanup professionals are not detectives or investigators. Crime scenes investigation is strictly handled by the relevant law enforcement forces. Crime scene cleaners only take over after investigators have left the scenes after a thorough investigation. Most people have this perception that law enforcement professionals are involved with crime scenes cleaning. As mentioned earlier, this myth is as a result of people watching too many movies whereby crime scene investigators handle everything from collecting evidence, assessment, and biohazard /blood cleanup to solving the respective crimes. Well, this myth is not true. In fact, law enforcement forces are never involved in actual crime scene cleaning. Crime scene cleanup is purely handled by professional crime scene cleaners. These technicians are highly trained, skilled, experienced, insured and certified on crime scene cleanup. Professional crime scene cleaners are normally equipped with the right equipment/supplies, techniques, and skills to ensure that crime scenes are not contaminated in any way. There is this misconception that Biohazard cleanup is meant for suicide, unattended death and homicide situations only. Be informed that Biohazard removal companies like KRI handle all kind of crime scene related services like blood cleanup, car accident scenes cleanup, hoarding cleanup, biological waste cleanup, Tear Gas Cleanup, and vehicle blood cleanup among others. 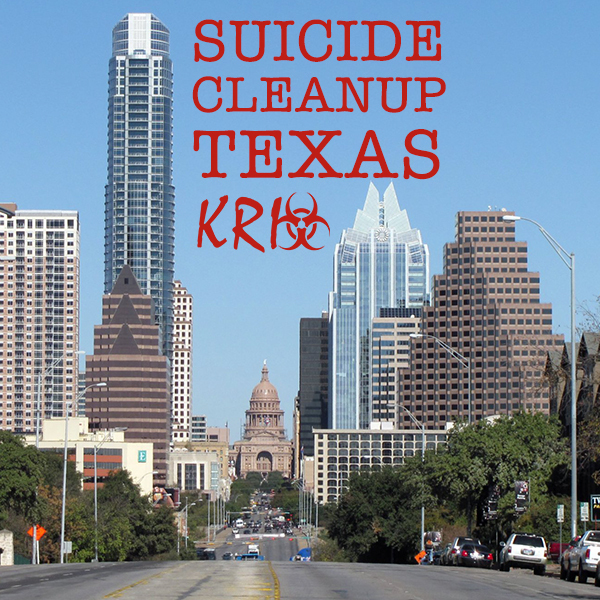 At KRI in Texas, we are dedicated and committed to making all kind of crime scene cleanups hassle-free, reliable and affordable. Choose us and find out why we are the best crime scene cleanup company in the entire Texas region.